Whispers in the Loggia: "Dear Young People, You Have It In You To Shout... Please, Make That Choice"
"Dear Young People, You Have It In You To Shout... Please, Make That Choice"
Over his prior Palm Sundays as Pope, Francis has consistently stuck to the rubrical request for a "brief" meditation, while shirking his usual practice for major liturgies in reflecting without a prepared text on the Passion of the Lord and the days ahead. 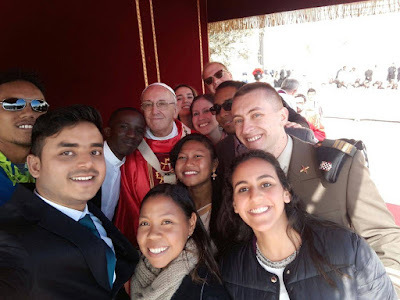 This year, however, the opening message of Holy Week was prepared, significantly longer – and, in a rarity for any homily of Papa Bergoglio's, footnoted. While this day has marked the Roman celebration of World Youth Day in years when the global gathering isn't held since the concept was instituted by now-St John Paul II, that focus was heightened this time around by the past week's Pre-Synodal meeting of 300 young people, culminating in yesterday's release of a landmark message from the group, now the clearest indicator of the agenda for October's Vatican summit of the world's bishops on youth in the church and their vocational discernment. 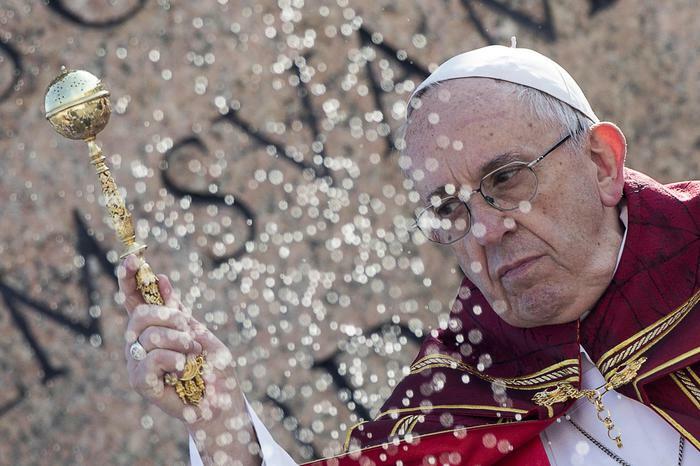 The first word of a long, dramatic Week, here's the English translation of Francis' homily (Readings) – as always, the year's first Mass in St Peter's Square. Jesus enters Jerusalem. The liturgy invites us to share in the joy and celebration of the people who cry out in praise of their Lord; a joy that will fade and leaves a bitter and sorrowful taste by the end of the account of the Passion. This celebration seems to combine stories of joy and suffering, mistakes and successes, which are part of our daily lives as disciples. It somehow expresses the contradictory feelings that we too, the men and women of today, experience: the capacity for great love… but also for great hatred; the capacity for courageous self-sacrifice, but also the ability to “wash our hands” at the right moment; the capacity for loyalty, but also for great abandonment and betrayal. We also see clearly throughout the Gospel account that the joy Jesus awakens is, for some, a source of anger and irritation. Jesus enters the city surrounded by his people and by a cacophony of singing and shouting. We can imagine that amid the outcry we hear, all at the same time, the voice of the forgiven son, the healed leper, or the bleating of the lost sheep. Then too, the song of the publican and the unclean man; the cry of those living on the edges of the city. And the cry of those men and women who had followed Jesus because they felt his compassion for their pain and misery… That outcry is the song and the spontaneous joy of all those left behind and overlooked, who, having been touched by Jesus, can now shout: “Blessed is he who comes in the name of the Lord”. How could they not praise the one who had restored their dignity and hope? Theirs is the joy of so many forgiven sinners who are able to trust and hope once again. And they cry out. They rejoice. This is joy. And so here is where another kind of shouting comes from, the fierce cry of those who shout out: “Crucify him!” It is not spontaneous but already armed with disparagement, slander and false witness. It is a cry that emerges in moving from the facts to an account of the facts; it comes from this “story”. It is the voice of those who twist reality and invent stories for their own benefit, without concern for the good name of others. This is a false account. The cry of those who have no problem in seeking ways to gain power and to silence dissonant voices. The cry that comes from “spinning” facts and painting them such that they disfigure the face of Jesus and turn him into a “criminal”. It is the voice of those who want to defend their own position, especially by discrediting the defenceless. It is the cry born of the show of self-sufficiency, pride and arrogance, which sees no problem in shouting: “Crucify him, crucify him”. And so the celebration of the people ends up being stifled. Hope is demolished, dreams are killed, joy is suppressed; the heart is shielded and charity grows cold. It is cry of “save yourself”, which would dull our sense of solidarity, dampen our ideals, and blur our vision... the cry that wants to erase compassion, that “suffering with” that is compassion, that is the weakness of God. Faced with such people, the best remedy is to look at Christ’s cross and let ourselves be challenged by his final cry. He died crying out his love for each of us: young and old, saints and sinners, the people of his times and of our own. We have been saved by his cross, and no one can repress the joy of the Gospel; no one, in any situation whatsoever, is far from the Father’s merciful gaze. Looking at the cross means allowing our priorities, choices and actions to be challenged. It means questioning ourselves about our sensitivity to those experiencing difficulty. Brothers and sisters, where is our heart focused? Does Jesus Christ continue to be a source of joy and praise in our heart, or does its priorities and concerns make us ashamed to look at sinners, the least and forgotten? And you, dear young people, the joy that Jesus awakens in you is a source of anger and even irritation to some, since a joyful young person is hard to manipulate. A joyful young person is hard to manipulate! But today, a third kind of shouting is possible: “And some of the Pharisees in the crowd said to him, “Teacher, rebuke your disciples.” He replied, “I tell you, if these were silent, the very stones would cry out”” (Lk 19: 39-40). The temptation to silence young people has always existed. The Pharisees themselves rebuke Jesus and ask him to silence them. Dear young people, you have it in you to shout. It is up to you to opt for Sunday’s “Hosanna!”, so as not to fall into Friday’s “Crucify him!”... It is up to you not to keep quiet. Even if others keep quiet, if we older people and leaders – so often corrupt – keep quiet, if the whole world keeps quiet and loses its joy, I ask you: Will you cry out? Please, make that choice, before the stones themselves cry out. Cf. R. Guardini, El Señor, 383. Cf. Apsotolic Exhortation Evangelii Gaudium, 94. 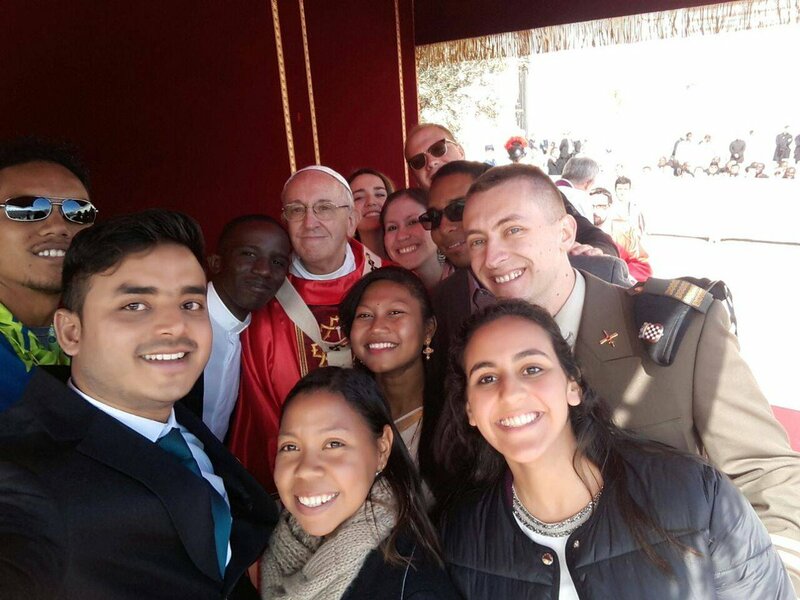 On Francis' 5th, "Credere In Deum"
For These 40 Days, Francis Pushes "Pause"